No sweets for diwali, No! That's what my brain was telling me all through the week. So I decided to make something and use a shortcut. I've heard about rosogollar payesh and have been wanting to try it. And I can get ready made rasgullas, that's half my work done. 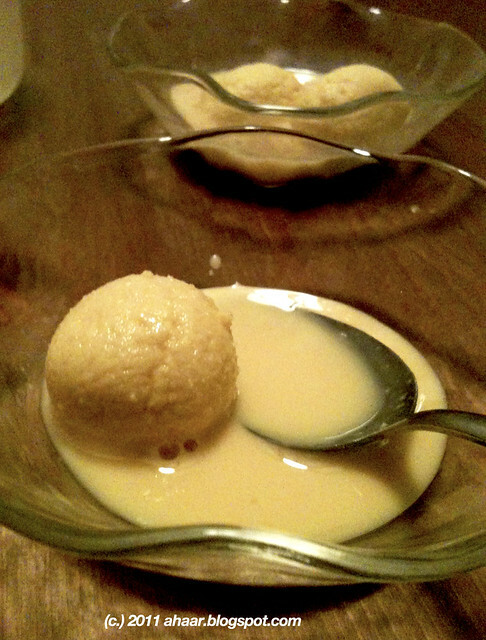 I used one tin of rasgullas and the syrup to sweeten the milk. It took me a while to thicken the milk, about a couple of hours, but it was sitting in the back and I stirred it often and let it do its magic. 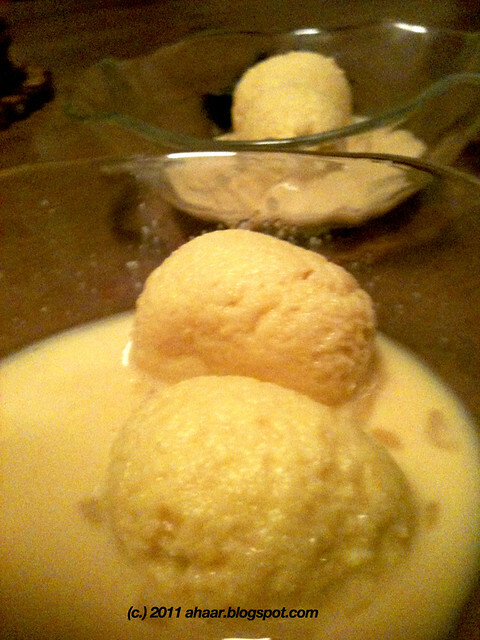 I cooked the rasgullas for 5-10 min in the milk which gave it a nice creaminess. I threw in a good handful of almonds for crunchiness and that's it! It's really simple, here's how to do it. 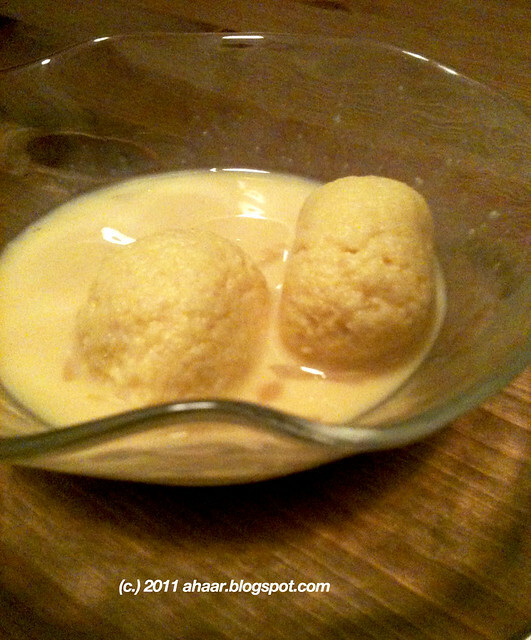 Take 5-6 tspoon of warm milk and soak the saffron. Heat the rest of the milk in a thick bottomed pan. Leave a spoon in the pan so that the milk doesn't spill over. Heat it on medium low and let it come to a boil. After it has been boiling for an hour, add in the syrup, half of the saffron and let it cook to another hour. You want to end up with about 2-3 cups of milk. Add the rasgollas, the rest of the saffron and almonds and let it cook for another 5 minutes on low. Take it off the heat and chill before serving. Happy Diwali! Have a bright and sparkling one. 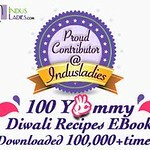 You may also want to check out the e-book the the Indus Ladies published with 100 sweet recipes including one of mine. 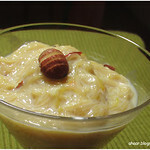 For more rosogollar payesh see here and here. The weather is changing, we're changing our wardrobe, putting things away from the summer. And in the midst of all this, I've lost my camera. There I've said it aloud! It's been a little more than a month, I kept thinking we've misplaced it somewhere, but I haven't found it. The possibilities of it being in a closet or a drawer is becoming slimmer and slimmer, unless Little A has a stash hiding in his special corner somewhere in the house! I've resorted to taking pictures with my iPhone till I get a new camera, and all the pics for this post was taken by it. Not too bad, what do you think? 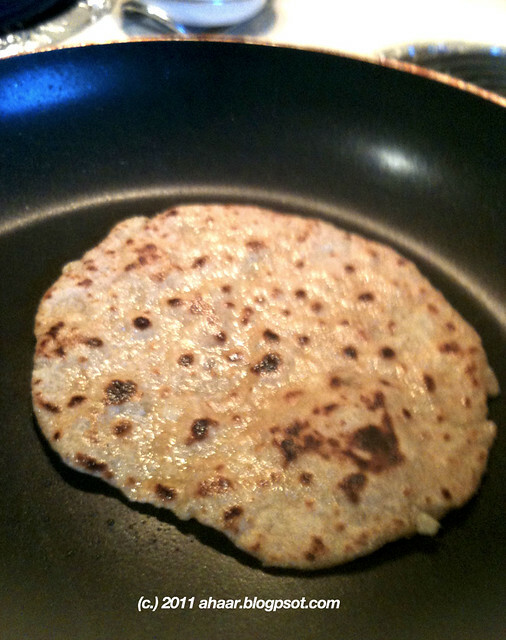 I made this aloo gobi paratha recently, and it turned out quite well. Little A had a special small one which he ate with raita. I'm going to try making more of these. What other vegetable can I use? Do tell. So to make it easier, I boiled the potatoes and grated the cauliflower and mixed it together with the dough to help rolling out and it helped. I didn't use any extra water and the parathas were soft. 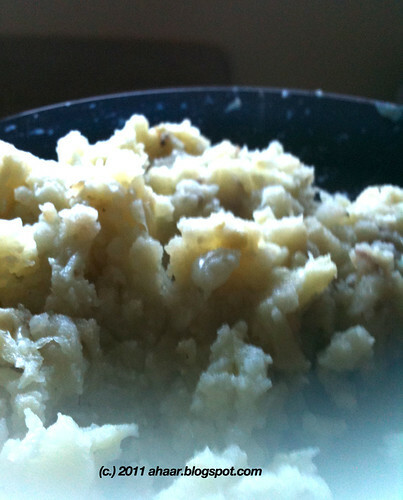 Boil the potatoes and mix it well with the grated cauliflower, coriander and cumin powder and the pepper. 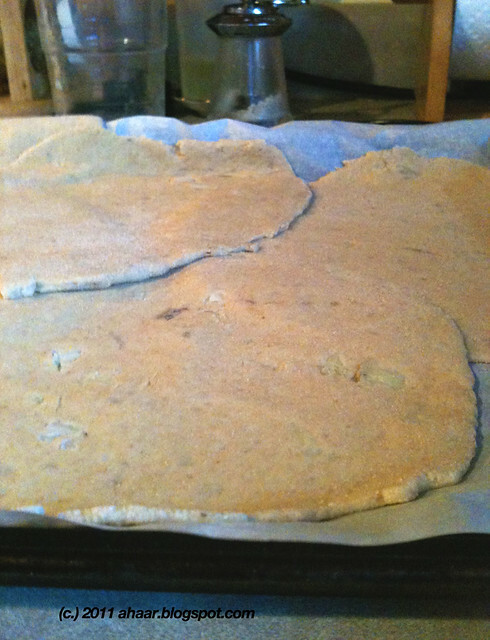 Take the dough, add the salt, chilli powder, a tspoon of oil and mix it with the potato and cauliflower mix. You can do it the other way too, putting the filling in the middle and rolling it out. 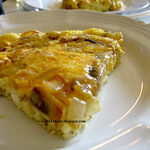 But mixing it together is easier and helps me in rolling out the parathas. Keep it aside for about 30 minutes or so. 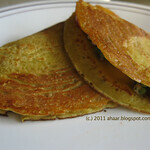 Heat a hot griddle or pan, cook both sides, put a tspoon of oil and cook till the brown spots appear. Shubho Bijoya everyone. How was your dusshera/Navratri/Durga Pujo. 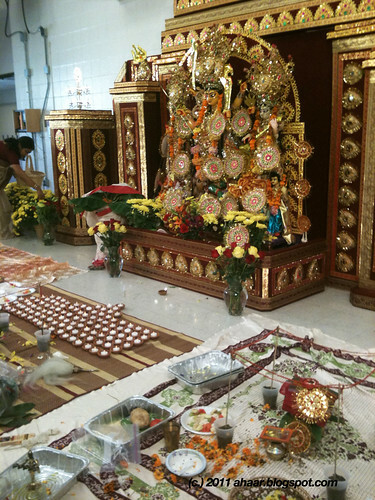 Here is a picture from the pujo we went to over the weekend. For the pujo prasad, I made some saffron sandesh. 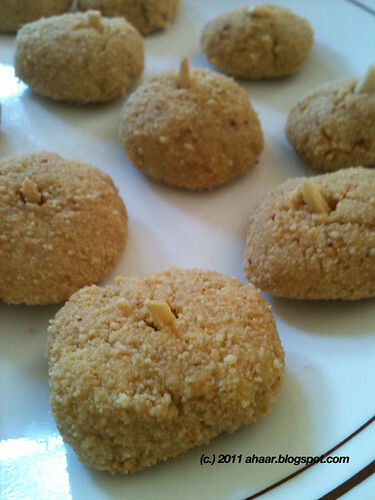 The last time I made sandesh was for diwali 3 years ago. My mom was here, and I had plenty of help. This time, I was on my own. I made chana (cheese) at home by boiling milk and curdling it with lime juice. I hung it in cheese cloth in two batches. And here is what happened. 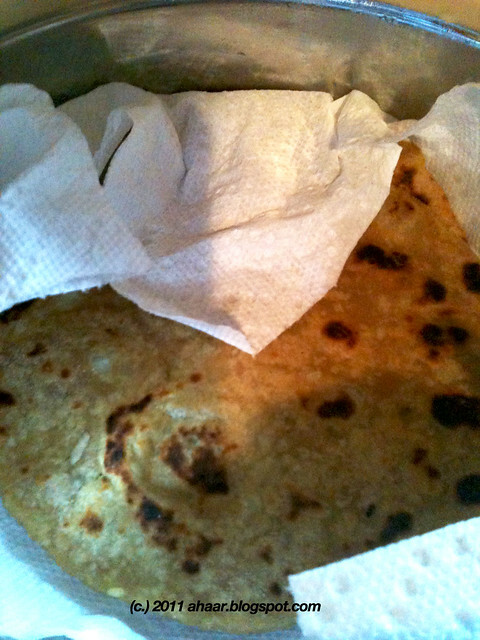 One batch came out well - the chana was smooth. The other one retained a little bit water (I didn't know that at the time), so the sandesh from that batch had small grains (you can see it in the images). The tip I got from my mom - put something heavy on the chana like a pan filled with water. This will help dehydrate the chana completely. I am going to try it next time. The sandesh tasted great. Everyone including Little A and his little friend at the pujo loved it. After the first one, Little A's friend came up to me and asked for another sweet. I offered her an alternative. "Do you want some strawberries?," I asked. "Does it have sugar in it?," she asked back. "No," I said. 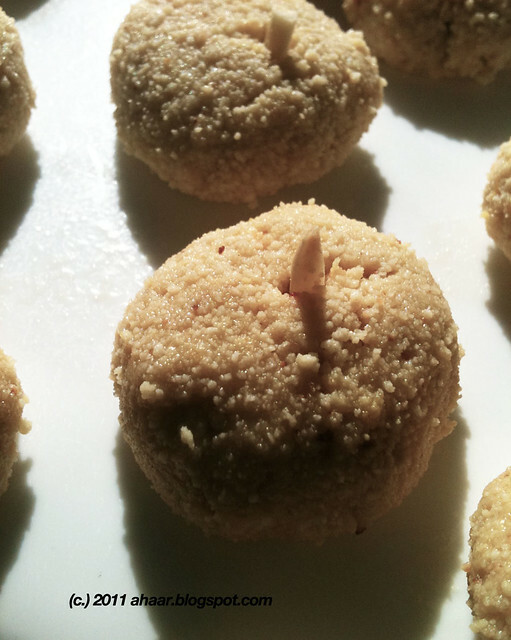 "Then I'll just have another sweet," she said and walked away with another sandesh. 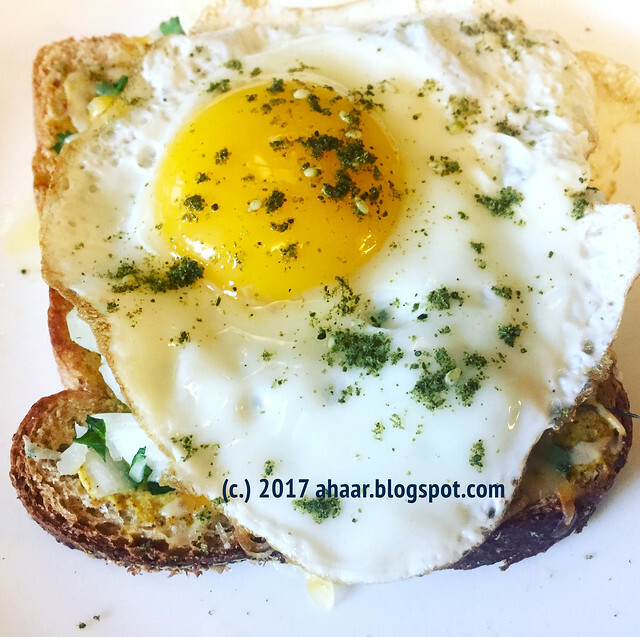 Soak the saffron in the milk and keep it aside. Mix the chana and the sugar really well taking care that there is no lumps. 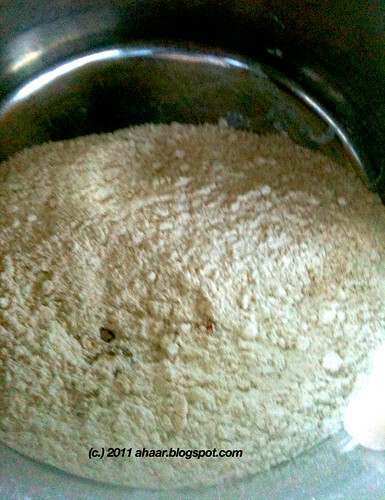 Once it's mixed well, transfer it to a deep botton pan on low medium heat and keep stirring it. It will loose water first and then start binding together. Keep stirring till it begins to stick together almost like a dough. Take it off the heat, mix the safrron milk and put it in the processor to make it smooth. 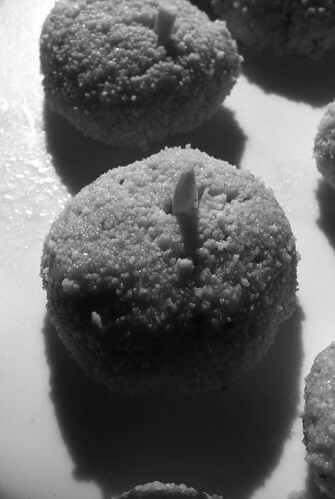 Make small balls, flatten them and put a sliver of almond in the middle. And this is going to Susan's Black and White Wednesdays. Thanks Suasan!